10 Tips for Collecting Fine Art Photography | Skinner Inc. Moon and Half Dome, Yosemite National Park, California, c. 1960, printed later, sold for: $7,200. Spend time reading publications and online sources about photography. Photograph Magazine, which lists current gallery and museum exhibitions, and iPhoto Central, each provide a wealth of information on topics ranging from connoisseurship to conservation and are some of my favorites. Visit galleries, shows, and auction previews to spend time talking to dealers and specialists who are happy to share their knowledge and enthusiasm. Join collector’s circles and friends of photography groups. In addition to meeting like-minded collectors and supporting the institutions’ activities, these groups provide access to artist talks and a wealth of curatorial knowledge that can expose you to a wide range of photographic practice. Once you’ve identified an artist, movement, or genre that intrigues you, do your research. Familiarize yourself with a photographer’s body of work. 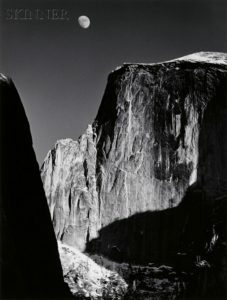 Are you interested in a particular series or a single iconic image such as Moon and Half Dome by Ansel Adams? Similarly, if you’re looking at an artistic movement such as Pictorialism or an approach like photojournalism, what are the aesthetic and stylistic qualities that attract you? 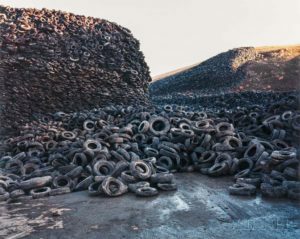 Oxford Tire Pile #5, Westley, California, 1999, printed 2002, sold for $10,455. For emerging and contemporary photographs, seek out work that is conceptually sound as well as visually successful. Above all, don’t be seduced by what’s hot in the art market since the longevity of the latest collecting frenzy or “it” artist is never guaranteed. As with other art or collectibles, learning how to evaluate the physical properties of a photographic object is also crucial to successful collecting. Factors to assess include print quality and condition, print date, process, edition size, dimensions, and inscriptions. Look for photographs that exhibit tonal range, luminosity, and unmarred surfaces (even a subtle mark visible only in raking light matters). If prints aren’t correctly washed or fixed, chemical inconsistencies over time can produce fading and changes in tone. Additional considerations are acidic mounts and adhesives, and crimps, creases, scratches, and tears from handling. As with works in other media, glowing smudges or spots observed under black light may indicate areas of restoration. Conservation is not in and of itself a bad thing, but learn to distinguish between minor repairs and surface cleanings and substantial treatment that can diminish the value of the object. A vintage print refers to one made within a few years after the negative was taken (and is typically more scarce). If a vintage print is not available or is outside your price range, later prints can be good options. While a vintage print is thought to be more faithful to the photographer’s original intentions, later prints can reflect the evolution of an artist’s aesthetic, or made by someone working under the guidance of a photographer or posthumously with the authority of the artist’s estate. Depending on the image, you should expect to pay more for a vintage print by the master. Another result of the development of the photography market is the practice of creating editions—a photographer agrees to make a finite number of prints from a single negative or digital file that is then typically retired. A single image can be printed in multiple sizes, each with its own edition, so keep this in mind when reviewing a numbered print. Some prints in an edition are never produced because the artist makes them based on demand. Also, as the edition comes closer to selling out, the prints often become more expensive. Similarly, while some early 20th century photographers like Ansel Adams regularly signed their prints, this was the exception rather than the rule. However, even if unsigned, prints can often be attributed based on style, print process, and other characteristics associated with a particular artist. Once you’re ready to buy, know your budget and stick to it. Be open-minded, but don’t be swayed—be sure to buy what appeals to your own aesthetic interests since you’re the one who will be living with the work. Don’t make impulsive decisions that you’ll regret. While they may gain in value, don’t acquire photographs with the intention of flipping them for a profit. Like any market, the art market is unpredictable, and you don’t want to be stuck living with a work of art that leaves you cold. Consider later prints and works by emerging photographers if your acquisition funds are modest. Don’t forget to factor in additional costs such as framing, storage, and insurance, and think carefully about where you’re going to put something since most photographs should not be displayed in locations that get a lot of sunlight. The lesson to be learned? Always do your homework. Make sure you educate yourself about the photographs in which you’re interested. See as much work as you can and talk to people who are willing to share their knowledge. Know the seller and his or her reputation. Pursue quality over quantity, and, above all, love every work you acquire. This entry was posted in Blog and tagged Ansel Adams auction, collecting photographs, fine art collecting, fine art photographs, fine photographs, photo, photographic prints, photographs, Photography, photography collections, photography fairs, purchase art photography, skinner auctions by Michelle Lamunière. Bookmark the permalink. I like how you suggested visiting galleries, shows, and auction previews to spend time talking to dealers when buying fine art. I am looking into collecting fine art pieces. Thanks for the tips for collecting art.